Stop everything you’re doing this instant. This is very important to read. Why? Because the Buick Cascada convertible is . 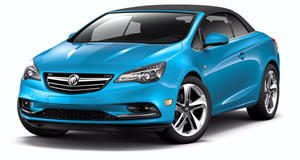 According to , General Motor’s premium Buick division has confirmed production of the Cascada will end this summer. American Buick dealerships have been instructed to place their final orders this month. We figured the Cascada’s time was limited for a few months now for a number of reasons, the main one being that it’s designed and built by Opel, the . Built in Poland, the Cascada is also outdated, having initially launched as the Opel Cascada in 2013. It debuted in the US as a rebadged Buick in early 2015. Another factor not working in the Cascada’s favor in the US nor Europe is that it’s a convertible, a segment with decreasing sales in both markets. The Cascada was not even a performance car, like the Mazda MX-5 Miata, but rather a front-wheel-drive two-door built on the same platform as the previous generation Chevrolet Cruze. Ever since the sale of Opel/Vauxhall to PSA, we knew the Cascada’s time was limited. PSA previously went on record saying it had no immediate plans to replace the convertible once it decided to end production. But the Cascada, as Buick pointed out, did its job in the US market. It was never expected to become a smashing sales success, but rather more of an image builder for the brand. All told, 17,000 Cascadas have been sold in the US so far since it went on sale for the 2016 model year. Last year, only 4,136 units were sold. It’s also important to note Buick’s long history with convertibles, and the Cascada was the brand’s first drop-top since 1991. Now that the Cascada is officially done and the upcoming demise of the LaCrosse large sedan, the sole remaining traditional car in Buick’s lineup will soon be the Regal fastback sedan and wagon.